Our next Movie Night is scheduled for Saturday, 8/31 at 7pm. 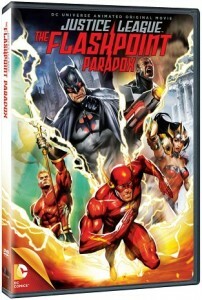 We’ll be showing Justice League: The Flashpoint Paradox. It’s the last Saturday of August and what better way to unofficially end the summer than with an action-packed comic movie? As usual, seating is BYO (we do have folding chairs in the shop) and we’ll provide the popcorn. There is no cost for the event — but you’re welcome to shop while here! 😉 About the movie: We all wish for the chance to go back in time and change the things. For The Flash, that coveted chance is within reach. He traverses time to right a violent, decades-past crime against his mother, but the ripples of his good intentions prove disastrous, as a fractured, alternate reality now exists in place of the familiar one. Stumbling through this twisted reality where even Superman is nowhere to be found, The Flash seeks the trusted wisdom of Batman, only to find a grittier, more violent Dark Knight in his place. 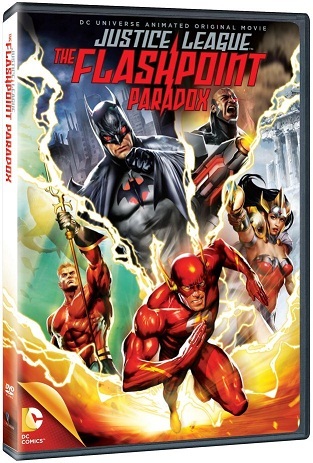 Together, with the help of Cyborg, they race to restore the continuity of Flash’s original timeline while this new world is ravaged by a fierce war between Wonder Woman’s Amazons and the Atlanteans, led by a battle-hardened Aquaman. The film is rated PG-13 by the Motion Picture Association of America for sci-fi violence and action throughout.